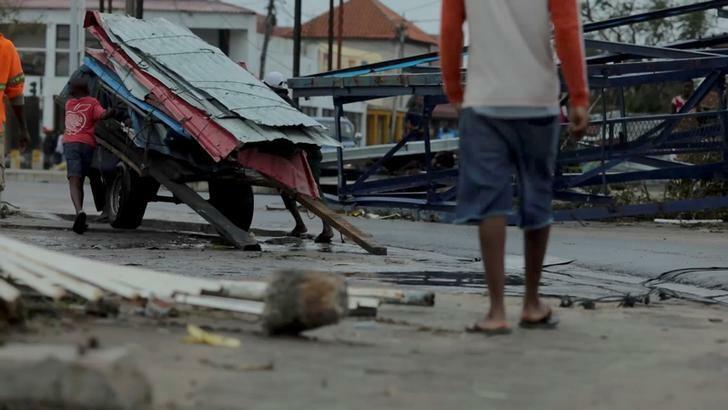 Mozambique started three days of national mourning on Wednesday after powerful cyclone winds and flooding killed hundreds and left a swathe of destruction across south-east Africa. Cylone Idai, which hit Mozambique’s port city of Beira on Thursday before moving inland, brought winds of up to 170 km/h which flattened buildings and put the lives of millions at risk. Mozambique’s President Filipe Nyusi said in a televised statement the cyclone killed more than 200 people and more bodies were still being found. In neighbouring Zimbabwe, the official death count stands at 98 but is likely to grow as hundreds are still missing. Rescue crews are struggling to reach victims, while aid groups say many survivors are trapped in remote areas, surrounded by wrecked roads and submerged villages. “Challenges remain in terms of the search and rescue of thousands of people, including children,” UNICEF said. It estimates 260,000 children were at risk in Mozambique. The Red Cross said at least 400,000 people are homeless in central Mozambique alone. Beira, a low-lying coastal city of 500,000 people, is home to Mozambique’s second-largest port and serves as a gateway to landlocked countries in the region. Local media reported food and fuel shortages in central Mozambique because Beira was cut off by road. In eastern Zimbabwe grieving families are rushing to bury their dead because the cyclone knocked out power supplies and stopped mortuaries functioning. Zimbabwe’s Grain Millers Association said 100 trucks carrying wheat destined for Zimbabwe were stuck in Beira. The European Union announced an initial emergency aid package of 3.5 million euros ($3.97 million) to Mozambique, Malawi and Zimbabwe for emergency shelters, hygiene, sanitation and healthcare. Britain also pledged aid.